9 − = 6 Required Please enter the correct value. When the markets closed today, the Dow ended above 18,000 for the first time since April. But, as we've said before, the daily Dow moves are not what matter most as you make your list of the best stocks to buy tomorrow when the market opens. The best stocks to buy will pay off long term, and market bumps along the way will only make us more money. What's likely to happen tomorrow is the financial news talking heads will ask everyone "how high can the Dow go?" They will also ask "so we're at 18,000. Can this rise continue, or are we in for a steep crash?" It's always great to know where the market might head. We give you a heads up here at Money Morning when we see warning signs or "Buy" signs. But remember, finding the best stocks to buy for the long term is much more valuable than finding a crystal ball to forecast market movement. As you look for stocks to buy, remember to find solid, healthy companies in growing industries. Even if their share prices pull back because of broader economic and market concerns, their underlying value will remain. You'll be owning a piece of a growing company that will reward you with a rising share price over time. Some of the best stocks to buy tomorrow are those that pay a dividend because they allow you to grow your wealth much more over time than if you invested in stocks that don't pay a dividend. 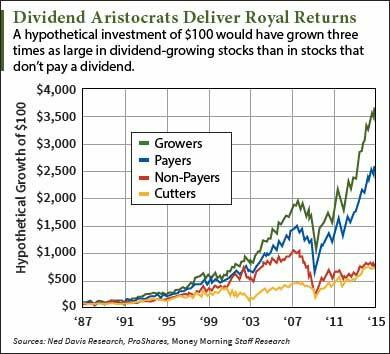 But even better are dividend growers – because your money grows as the payout does. We recently showed investors a list of the best of the best when it comes to dividend growers. Consider these stocks for your stocks to buy list. There are 18, and they've all raised their dividends for 50 years or more. Their 10-year annualized total returns range from 3.9% to 19.6%. Get a look at these dividend stock winners here. Paying a dividend isn't the only trait we look for in stocks to buy. We also like to see companies that provide innovative products in industries we know will be a major part of our future, like the Internet of Things. We recently detailed for people just how much money the IoT will generate for the economy. The companies that provide components that make the IoT work are going to be incredibly important. This means their share prices will rise along with their sales. Here we outlined some of the best tech stocks to buy tomorrow that will profit from this trend. Check out this list – these stocks are going to soar on a $6 trillion IoT market. Sometimes economic developments highlight the stocks that are best to buy now, when – in this case – irresponsible central banks could affect change. For example, right now the U.S. Federal Reserve is rumored to be eyeing a rate hike – although, the recent jobs report could have put that change on hold. As our Chief Investment Strategist Keith Fitz-Gerald noted recently, rising rates can be a great situation for our money when we know what to look for and get in before the market prices a move into shares. Fitz-Gerald didn't just tell us – he showed us how to profit with a stock to buy that won't be at the mercy of the Fed's moves. This company is going to be an essential part of life going forward, and it doesn't need the Fed's monetary policies to succeed. That's the sign of a good stock to buy. This one in particular sells a product you cannot live without, and its customers are more than 15 million people in 47 states. That's a huge part of the U.S. market share. Get the full story on this stock here. Besides these trend and news-based stocks with solid long-term outlooks, sometimes you want a reliable "starter" play to get your portfolio going. We have that for you as well. These investments aren't stocks, but they should go on your stocks to buy tomorrow list if they aren't in your portfolio already. The first one was recently highlighted in our "One-Grand Approach to Wealth." It's a very simple investment – with big profit potential. It's a great place to put $1,000 because 1) there's no minimum investment that excludes that amount, and 2) it's broadly diversified so you get a piece of many profitable industries. Get that pick here. The next step in this investing process is what to do with $5,000. Go here to get started: "How to Invest for Permanent Wealth with $5,000." Finally, this last stock is one of our favorites for 2016 – and for years ahead. Wall Street tends to hate on it from time to time, but that's more for show and for headlines. What's really behind this stock is a company with a ton of cash, attractive products, and buckets of profits coming in for years. This stock to buy tomorrow also pays a dividend – and you know how we feel about that. This is a solid dividend that is not likely to disappear. Some of the world's biggest and smartest investors have poured money into this stock recently. They know the keys to this company's success are strong and will continue to reward investors. You can find out all you need to know about this great stock pick here. We'll update our stocks to buy tomorrow (and today) list frequently, so stay tuned to Money Morning for top stock picks. Feel free to comment on this story with questions! While we can't give personalized investment advice, we will try to answer as best we can. Follow Money Morning on Facebook and Twitter.